I can’t get a good picture of this soup. This is so easy to make and it’s amazing to eat and the picture looks like eh, whatever. So just glance over the picture and know that you need to make this soup. 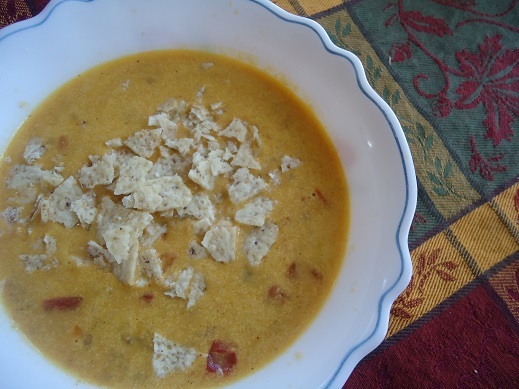 Here’s my happy little soup secret: This Taco Soup is made with none other than this Real Food “Velveeta” and Rotel Recipe. See, you make that recipe and you double or triple it because it just makes sense because it is so delicious. 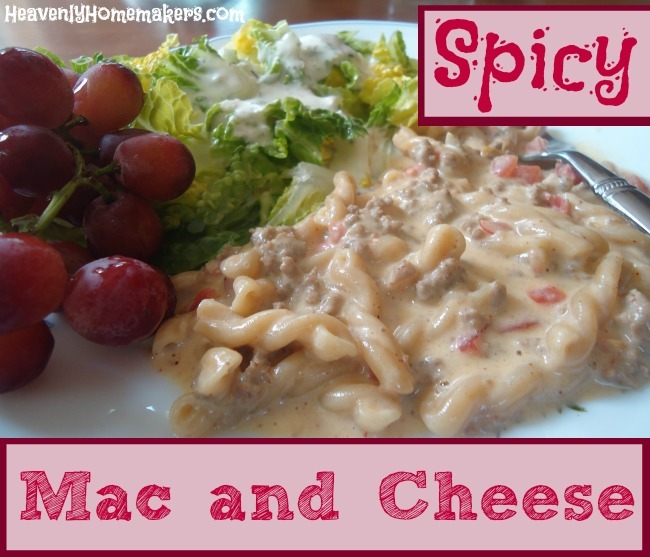 You eat it with chips, or you boil some pasta and make it into Spicy Mac and Cheese. Or if you’re feeling soupy, you stir in some chicken or beef broth and top it with crunched chips. 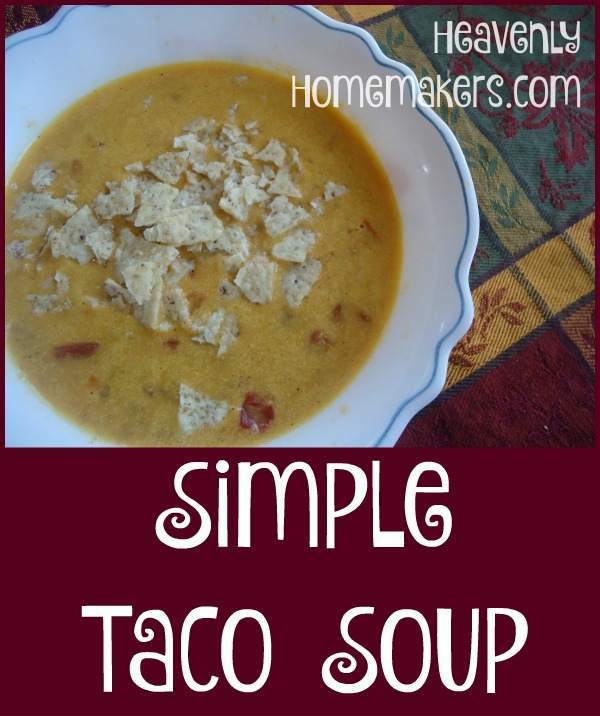 It becomes Taco Soup and you love it so much you can’t even stand it. Or maybe it’s just me. Brown the hamburger meat in a large pot. Add butter to the meat, melting it throughout the pot. Sprinkle in corn starch, coating the meat. Pour in water, chili powder, and salt. Turn heat up and stir until the mixture thickens. Stir in Rotel and broth, heating for about 5 more minutes. Add shredded cheese, stirring until the cheese has melted and the dip is smooth. I know I’ve said it before, but I really, really love making triple batches of Real Food “Velveeta” and Rotel. It’s super easy and it is so versatile! Every few weeks I make it and store it in my fridge to pull out for easy meals. Now we use it to make soup too! Do you see why I make big batches of this?? 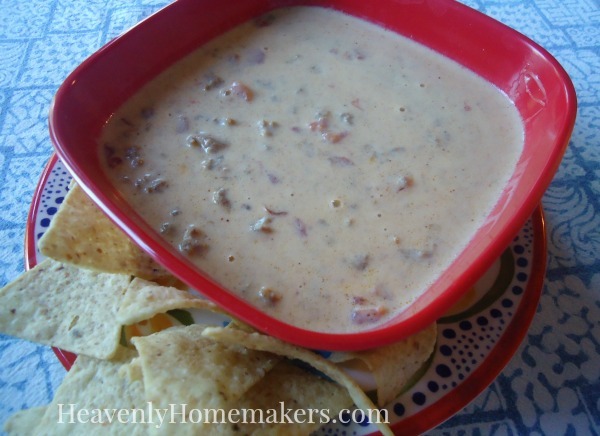 Have you made the Real Food “Velveeta” and Rotel recipe? What’s your favorite way to eat it? We just made (and still have some leftovers), your “Healthier Cheese Dip” for Superbowl Sunday. Don’t you think that would make a similar, good soup, too? I may just try it!